Glyphosate is used in the U.S. at roughly 300 million pounds per year in agriculture, with about 90% for agriculture, and 10% for non-ag uses (Benbrook 2016). It gets on our lawns and gardens, our parks and playgrounds, our farm fields and food crops, and then runs with rainfall into the waterways and thus our drinking water. Its use to dry crops by being applied shortly before grain crops like oats go to market is thought to be particularly problematic for getting residues into our food supply. Glyphosate is linked to cancer risks, as well as non-cancer diseases including harm to the kidney, liver, immune system, reproductive system, and during early-life development. All this—including the elevated cancer risks—is described in the ATSDR Toxicological Profile of Glyphosate just out this week. I provide scientific details from the report, as well as the politics of scientific suppression around this hazardous agrochemical in my companion blog, ATSDR Report Confirms Glyphosate Cancer Risks. Much like the evidence from medicine, where the overuse of antibiotics in agriculturesuch as livestock leads to the creation of sometimes deadly ‘superbug’ drug-resistant strains of bacteria, the overuse of herbicides can create ‘superweeds’ (see NRDC 2010 warning about this). Glyphosate-resistant weeds threaten the whole Roundup-Ready technology by making the herbicide ineffective. According to a published report by pesticide expert Dr. Chuck Benbrook, when the spreading problem of glyphosate-resistant weeds could no longer be denied, and facing continued EPA inaction, in the mid-2000s agrochemical giant Syngenta proposed a draw-down plan to all the registrants of glyphosate-based herbicides (Benbrook 2018). The idea, according to Dr. Benbrook, was to rotate the use of the herbicide with years when it isn’t used and conduct annual monitoring to adjust the rotation to be most effective at stopping glyphosate-resistant weeds. The plan would only work if it were adopted across the industry, but Monsanto refused. In fact, glyphosate-tolerant seed crops are so popular that it propelled glyphosate to one of the most widely used agrochemicals in the world, with a global rise of almost 15-fold over the two decades since Roundup-Ready crops were put onto the market in 1996 (Benbrook, 2016). I guess Bayer AG, which recently acquired Monsanto (June 2018), must believe that herbicide-tolerant GE is a product line that is too big to fail, despite news reports of, “more than 11,200 people” lined up with lawsuit claims linking their cancer to glyphosate. Bayer lost both of the two jury trials that have so far wrapped up, though it plans to appeal and like Monsanto continues to tout the safety of the product. Reuters reported this week that, “One of Bayer’s largest shareholders tore into the company’s management on Wednesday for underestimating the legal risks of its takeover of Monsanto, setting the stage for a fiery annual general meeting after a 30 percent plunge in the shares” (Reuters, Apr 11, 2019). Denying science while investing in cancer-causing chemicals is a business model that may not be paying off as Bayer had hoped. The regulatory oversight for genetically-engineered plants and foods is complicated. It is described somewhat in the 2017 Update to the Coordinated Framework for the Regulation of Biotechnology. The Food and Drug Administration (FDA) is responsible for food safety. But, its authority to regulate GE plants is under its “Statement of Policy: Foods Derived from New Plant Varieties” (FDA 1992 policy). which presumes that GE is a simple extension of crop breeding (like crossing a mandarin orange and tangerine to make a tangelo). FDA presumes that GE seeds and plants do not raise any new health risks. The exception is if the nutrition of the food is altered, this may trigger a new assessment. Industry itself makes the determination about the safety of the GE trait or plant, and the issue is never reviewed again. The voluntary nature of this consultation between the chemical industry developer and FDA is unchanged in the 2017 Update Coordinated Framework (See Case Study p. 43-44). 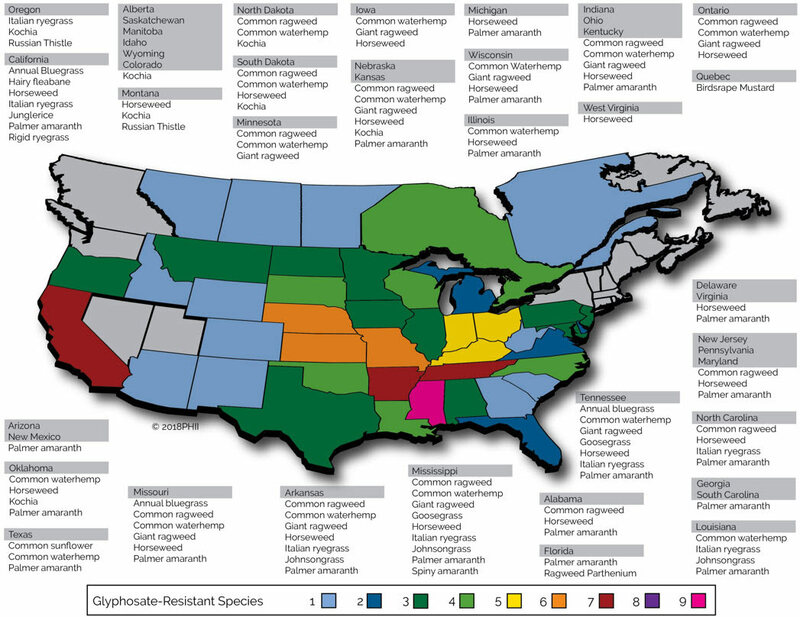 The EPA Pesticide Office is responsible for the review and approval of pesticides, including consideration of potential risks to pesticide applicators, field workers, consumers, and wildlife. Addressing resistance concerns also falls to EPA. US Department of Agriculture (USDA) regulates the herbicide-tolerant plant. The regulatory failure to invoke the added 10-fold safety factor required by the Food Quality Protection Act (administered by EPA) for uncertainty regarding exposure to GE plants (approved by USDA). USDA’s exemption of many GE plants including glyphosate-tolerant crops that are made using gene editing technologies instead of the more traditional definition that entails inserting foreign DNA. EPA’s current considerations of the risks and benefits of pesticides including herbicides fail to account for the adverse cumulative impacts to human health and biodiversity of multiple herbicides and herbicide combinations. EPA even fails to consider their cumulative risks when they are in the same product and clearly will be applied simultaneously, such as the glyphosate-2,4-D product Enlist Duo that was first approved by EPA in 2014 in response to glyphosate-resistant weeds. (see details including NRDC litigation here). The failure of federal agencies including EPA to require toxicity testing of the formulated pesticide products is a significant data gap, and likely to lead to an underestimate of risk to the population. It’s not just weeds that become resistant to the overuse of weed-killing chemicals. Dozens of fungicides are also used on seeds, to keep them from rotting during storage and in the field. Like the weed-killing herbicides, the fungus-killing fungicides were long promoted by the chemical industry as being safe for humans. Medical experts and specialists now believe that the global rise in drug-resistant fungi like the Candida auris ‘superbug fungus’ and other drug-resistant fungi strains may be linked to the overuse of azole fungicides on crops in agriculture (Chowdhary et al 2013). The best solution to this problem is to stop overuse of chemical fungicides. The C. auris resistance problem is a tragic example of why ignoring the problem is perilous. The regulation of pesticides is a mess—with federal “regulators” far too cozy with the chemical manufacturers they are supposed to regulate—and for GE products it is even worse. As my colleague Dr. Sylvia Fallon describes, we are engaged in chemical warfare against the birds and bees and flowers and food crops that we need to support ourselves. More corn and soy won’t save the planet but increasing biodiversity just might save the planet. More farmers are i moving away from herbicides and pesticides that are costly, toxic, and no longer even effective, and instead switching to organic methods. More and more ecologically aware farmers are successfully applying the tried and true methods of regenerative agriculture. Studies have shown that this approach significantly increases soil quality and promotes biodiversity, resulting in a decreased need for chemical inputs, including pesticides and fertilizers. Cancer should not be the cost of doing business!